Conclusions - Towards a neuro-epigenetic hypothesis of depression? Adult neurogenesis represents a dynamic level of modulation upon the neuroplastic properties of the mature nervous system, that is essential to the homeostatic brain function. The adult neurogenic process comprises several sequential steps, all of which subjected to an assortment of cell-intrinsic and neurogenic-niche complex regulatory mechanisms. Among these, epigenetic regulation is now emerging as a crucial regulator of several neurogenesis steps. In particular, the active regulation of hippocampal neurogenesis and its repercussions in global hippocampal function are of special interest for the biomedical field, since imbalances at this level have been strongly related to the precipitation of several neuropsychyatric disorders, such as depression. Indeed, growing evidence supports that the detrimental effects on adult hippocampal neurogenesis, that have been associated with depression, might be epigenetically-mediated. Therefore, understanding the epigenetic regulation of the neurogenic process may provide a link between neurogenesis imbalances and the deterioration of the behavioural and cognitive domains frequently affected in depression, thus contributing to unravel the complex pathophysiology of this disorder. Here, we outline some of the major epigenetic mechanisms contributing to the regulation of hippocampal neurogenesis and discuss several lines of evidence supporting their involvement on the development of imbalances in the neurogenic process, often correlated to behavioural and cognitive deficits commonly observed in major depressive disorder. The beauty of research is that it ultimately defeats all established dogmas, even though some take very long to fall. Cajal's decree concerning the immutability of the central nervous system (CNS) has been reviewed and updated during the last decades, due to mounting evidence that substantiates the regenerative potential and plasticity of the CNS. Despite the initial reluctance manifested towards the first reports of post-natal neurogenesis, it is now well established that neurogenesis, a process that comprises the generation, differentiation and integration of new neurons in the preexisting brain neuronal networks, occurs in the adult brain, prevailing throughout life in specific brain areas, where neurons are persistently generated [1, 2]. Such spatially defined brain regions where neurogenesis occurs display a permissive microenvironment for the maintenance and differentiation of neural stem cells and to their proliferation. Currently, two neurogenic brain regions are broadly recognized in the mammalian adult brain: the subgranular zone (SGZ) of the hippocampal dentate gyrus (DG) and the subependymal zone (SEZ) in the lateral ventricles. In the hippocampal formation, the precursor cell population resides throughout the SGZ, with specific gradients . After being generated in the SGZ, newly-born cells become committed to a neuronal lineage and migrate into the granule cell layer (GCL), where they mature to become excitatory glutamatergic granule neurons [4, 5]. In the SEZ the precursor cells are mostly found in the anterior segment of the walls of the lateral ventricles. Here, newly-born precursor cells generate neuroblasts that will migrate along the rostral migratory stream (RMS), reaching the olfactory bulb (OB), where they fully differentiate mostly into granule inhibitory interneurons [6, 7]. In addition to these two consensually accepted neurogenic regions, some authors have presented evidence that neurogenesis occurs in other brain areas, including the striatum , the cortex [9, 10], the amygdala  and the hypothalamus [12, 13]; however, as these results are still disputable [14, 15], further studies are needed in order to elucidate if other neurogenic niches are indeed present in the adult brain. Although it is now indisputably accepted that neurogenesis occurs in the adult brain, its functional relevance remains to be fully established. While it is clear that this phenomenon is confined to very discrete brain regions, the generation of new neurons in the post-natal period constitutes a new dimension of plasticity, with both direct and indirect impact on neuronal remodelling and repair, that is now regarded by the biomedical field as a promising therapeutical target in several neuropathological contexts. Notably, abnormal alterations in the hippocampal neurogenesis process have been implicated in an assortment of neuropsychiatric disorders [16–18]. Several research works, seeking to unveil the biological mechanisms underlying these disorders, became comprehensive studies about the hippocampal neurogenic process. Quite surprisingly, the functional relevance of adult neurogenesis in the SEZ has not yet been directly related to any specific neuropathological condition. Integration of newly-born hippocampal neurons into pre-established neural networks seems to be achieved through highly regulated sequential steps: proliferation of neural stem cells, generation of amplifying progenitors, cell migration and, finally, maturation in the definitive destination with axon and dendrites formation and establishment of new synapses with preexisting surrounding cells [19–21] (Figure 1). This process of post-natal neurogenesis largely recapitulates the embryonic one, with the major difference that new neurons have to undergo these steps in an already mature microenvironment, having to integrate preexisting neural circuits. The adult hippocampus SGZ contains an heterogeneous precursor cell population, distinctly identifiable through a particular set of molecules that each cell type expresses. The quiescent neural progenitors (QNPs) are believed to be the multipotent stem cells residing on the hippocampus [5, 22]; they are also known as neural stem cells (NSCs) or, according to an alternative nomenclature, type-1 progenitor cells. Having both morphological and antigenic glial properties [23, 24], they can be further distinguishable into two classes according to their spatial orientation: horizontal astrocytes (hA) and radial astrocytes (rA). These cells divide asymmetrically giving rise to daughter cells known as transiently amplifying neural progenitors (ANPs; also generally designated as type-2 progenitor cells). This phase of the neurogenic process comprises the emergence of the first indications of neuronal or non-neuronal lineage commitment , being for such reason, a decisive checkpoint in the determination of neural progenitors cell-fate. Anomalous alterations in this phase of the neurogenic process often result in long-term neuropathological traits . Studies have showed that ANPs are highly mitotic [1, 25], dividing symmetrically and giving rise to neuroblasts (NBs; also named type-3 progenitor cells). Neuroblasts are intermediate precursors in the generation of new granule neurons, expressing the microtubule associated protein doublecortin (DCX) that will be crucial for further maturation and migration [19, 26]. Once the newborn cell becomes a neuroblast, it exits the proliferation cycle, and migrates towards its final destination in the GCL. Here, the newly-born cells will fully maturate, elongating their axons and establishing new functional connections, eventually becoming a mature granule neuron. The time window that takes to a newborn cell to be fully mature and integrated in the preexisting neural network is typically referred to be approximately five weeks [27, 28]; however, some authors claim that the entire period of adult neurogenesis can take as much as 7 weeks [29, 30], as this is the time required by the new neurons to become electrophysiologically indistinguishable from the remaining neuronal population. Importantly, neurogenesis is a fine tuned process, rather than a mass phenomenon, during which most newborn cells are eliminated [31, 32]. The mechanisms that regulate this neurogenic process are still to be fully understood, but recently, several studies proposed a complex epigenetic orchestration of adult hippocampal neurogenesis. Functional and structural chromatin properties are actively regulated in hippocampal NSCs. In fact, and despite being a relatively recent concept in the neuroscience field, the importance of epigenetics on the fine regulation of proliferation, fate specification and differentiation of NSCs is now becoming to be recognised as fundamental for the balanced production of new neuronal and glial cells, necessary for the homeostatic brain function. Therefore, it becomes gradually evident that both extracellular signalling and intracellular epigenetically regulated gene expression programs are dynamically involved in adult neurogenesis. Notably, the intracellular epigenetic program regulating adult neurogenesis is proposed to be quite similar to the epigenetic regulation occurring during development, but is also determined by a myriad of new extrinsic physiological and environmental stimuli , that allow the alignment of neurogenesis with the external requests. Even though there is still much to be known, a global picture regarding the epigenetic orchestration of adult neurogenesis commences to emerge (Figure 2). Epigenetic regulators of the adult hippocampal neurogenic process. The adult hippocampal neurogenic process is subjected to a complex epigenetic regulation, with important functional implications. 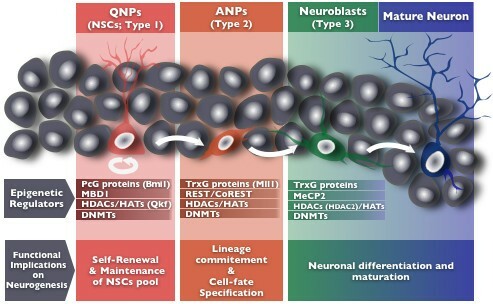 Different types of epigenetic regulators have been identified, including PcG and TrxG protein complexes, MBDI, the REST/CoREST complex, MeCP2, HDACs, HATs and DNMTs, specifically involved in the fine tunning of the proliferation and specification of neural progenitors, as in the differentiation and maturation of the newborn neurons. Epigenetic regulators, such as the PcG protein Bmi1 and the methyl-binding protein MBD1 are involved in the regulation of the initial steps of neurogenesis, participating in NSCs self-renewal and maintenance. Later on the neurogenic process, the transcriptional activation of specific gene batteries by TrxG proteins like Mll1, together with the action of chromatin remodeling complexes such as the REST/CoREST complex and its molecular partners will allow the progenitor cells to exit the proliferation cycle and become committed to a neural cell lineage. Finally, the action of regulators such as MeCP2, will contribute to post-mitotic neuronal differentiation and maturation. Some epigenetic regulators, such as HDACs, HATs and DNMTs are involved in several regulatory checkpoints of the adult neurogenic process, integrating several protein regulatory complexes involved in the transcriptional activation of pro-neurogenic genes. Epigenetic regulation is implicated in the first stages of adult neurogenesis, by promoting the maintenance of the self-renewal potential of adult NSCs. Molofsky and colleagues  highlighted the importance of the trithorax (trxG) and the functionally antagonistic polycomb (PcG) groups of proteins on such regulatory function. The trxG and PcG proteins are chromatin modifier complexes that will, respectively, activate or silence the targeted loci, maintaining such transcriptional state for several cell divisions [35–37]. In particular, the PcG zinc-finger protein Bmi1 has been identified as an important epigenetic regulator, promoting H3K27 methylation and repressing the expression of the cyclin-dependent kinase inhibitor gene p16 (Ink4a); as a consequence the proliferative rate of adult NSCs is maintained [38, 39]. In addition, Methyl-CpG binding protein 1 (Mbd1) also appears to be involved in adult NSCs self-renewal in the SGZ. So far, this is the only Mbd protein reported to be specifically involved in hippocampal neurogenesis; Mbd1 deficient mice, although without noticeable developmental deficits, have reduced NSCs proliferation that correlate with cognitive impairments in spatial memory . This protein binds to the promoter region of the gene encoding the mitogen Fibroblast Growth Factor 2 (Fgf2), controlling its expression on adult NSCs of the SGZ. Regulation of the expression of Fgf2 provides the precise control of the timing for the cell to exit the proliferation cycle and to initiate its differentiation . In addition, the MYST family histone acetyltransferase Querkopf (Qkf or Myst4), whose expression was recently described in the adult hippocampus , also appears to be involved in the regulation of adult NSCs self-renewal, as NSCs isolated from Qkf mutant mice exhibited a reduced self-renewal capacity . 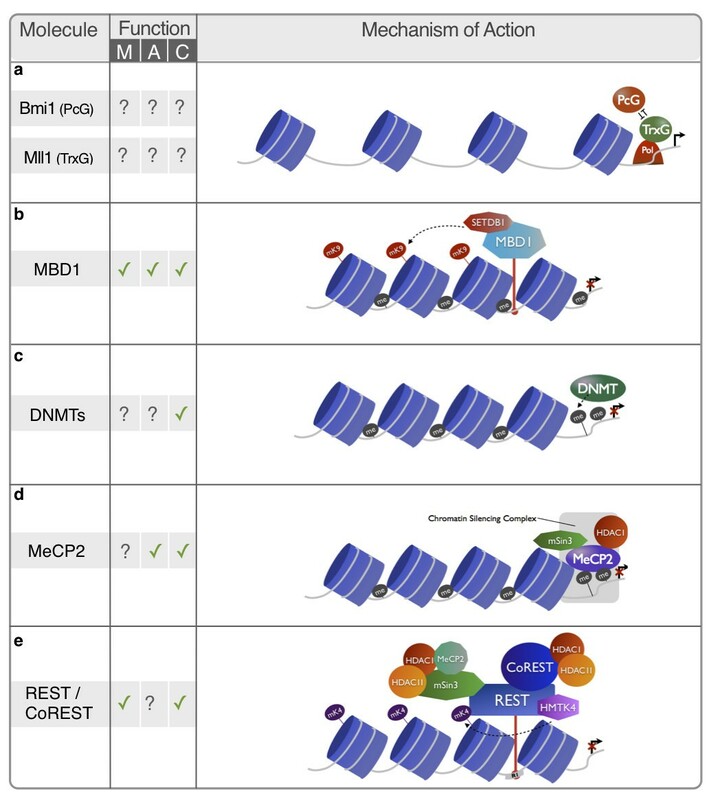 It is important to mention that these epigenetic regulators involved in the adult NSCs maintenance, operate together with several other epigenetic protein regulators such as DNA methyltransferases (DNMTs), histone acetyltransferases (HATs), histone deacetylases (HDACs), and histone methyltransferases (HMTs), that will actively participate in further regulatory steps of the neurogenic process. When exiting the mitotic phase, neural progenitor cells will eventually become committed to a specific neural cell lineage and start to differentiatiate. Neuronal or glial lineage commitment of NSCs involves a temporal-defined mutual regulation of several gene batteries. Commitment to a neuronal cell-fate, for instance, involves the repression of gliogenic genes; the alternative scenario of glial differentiation, requires the inhibition of genes responsible for neuronal specification. This is achieved through transcriptional and epigenetic regulation, that will integrate also the cell response to the extrinsic environment. In this context, HDACs and HATs are believed to exert an important role in the transduction of physiological signals to the stem cell genome, activating or repressing specific gene programs in NSCs. In general, HDACs catalyze the deacetylation of nucleossomes, that become highly condensed, obstructing the access of transcriptional activation factors to their binding sites and, therefore, resulting in transcriptional repression. In contrast, HATs catalyze the opposite reaction, resulting in global nucleossomal relaxation and, consequently, in increased transcriptional activity . A hint for the importance of these epigenetic modifiers on the neurogenic process, was provided when administrating HDACs inhibitors (HDACis), such as trichostatin A or valproic acid (VPA) on rats. Using such experimental approach, it was shown that HDACis promote neuronal differentiation of adult neural progenitor cells . In addition, at this differentiation stage other proteins, such as trxG proteins, exert their modulatory actions which will ultimately determine cell-fate specification. One interesting example is provided by the trxG family member, Mll1 (mixed-lineage leukaemia 1), which is a H3K4 HMT. Mll1-deficient NSCs retain the capacity to proliferate and fully differentiate into glial lineages, but neuronal differentiation becomes severely compromised. Therefore, Mll1 seems to be required to mediate the transition from a silenced to an active transcriptional state in key loci of postnatal neural precursors necessary for the induction of neurogenesis . Although several other epigenetic regulatory players in cell-fate specification have been identified, it becomes difficult to consider a unifying model through which all epigenetic regulatory actions are coordinated. Nevertheless, a promising candidate for orchestrating these epigenetic events is the DNA binding protein REST (R epressor E lement 1 S ilencing T ranscriprition Factor). REST was first described in 1995, as a repressor of neuronal genes containing a 23 bp conserved sequence, known as RE1 (Repressor Element 1, also named neuron-restrictive silencing factor, or NRSF) [47, 48]. This transcription factor coordinates the action of several epigenetic complexes that are required when switching from the undifferentiated stem cell state through the stages of neuronal or glial cell-fate specification [49–51]. After binding to DNA, REST orderly recruits several DNMTs, HMTs, HATs, HDACs, MBDs, co-regulators (CoREST) and cell-cycle proteins, promoting shifts in the overall transcriptional state of specific gene batteries in a cellular context-sensitive manner [49, 52]. The recruited epigenetic modulatory proteins, together with specific non-coding RNAs, interact with REST, allowing the precise control of the cellular events that lead to neural progenitors subtype specification [53, 54]. Epigenetic regulation is now known to be also implicated in the final maturation of newborn neurons; at this stage it has an important role in promoting the integration of newly-born neurons into the preexisting neural networks. HDACs and HATs appear to be once again decisive for neuronal maturation and early synaptogenesis [55, 56]. Using mice deficient on HDAC1 or HDAC2, it was shown that a decreased activity of both enzymes in immature hippocampal neurons triggers excitatory synapse maturation; however, exclusive inhibition of HDAC2 triggers the opposite effect and promotes reduced excitatory synaptic activity [55, 57]. Another important epigenetic regulator in the SGZ granule neurons is the methyl-CpG-binding protein 2 (MeCP2). Interestingly, in postmitotic SGZ neurons, the expression of brain-derived neutrophic factor (BDNF), a neurotrophin actively involved in dendritic growth and spine maturation, is associated to reduced DNA methylation and to the release of a chromatin repressive complex comprising MeCP2, in which these cells are highly enriched [58, 59]. Furthermore, it has been demonstrated, using knockout mice, that MeCP2 deficiency causes severe deficits in the maturation of newborn neurons in the SGZ, including delayed differentiation and reduced dendritic spine density . In addition, BDNF expression (as well as FGF) can be controlled by other epigenetic regulators such as the DNA-damage inducible protein 45b (Gadd45). This protein is an activity-induced immediate early gene, and its transcription is sensitive to various stimuli that increase neurogenesis by DNA demethylation in mature neurons of neurogenic niches, contributing to the paracrine secretion of neurotrophic factors (BDNF and FGF) that control key processes in adult neurogenesis, including neuronal and dendritic maturation [61, 62]. Finally, it is important to note that this epigenetic regulation is not only mediated through cell-intrinsic mechanisms, and that epigenetic mediators are likely stable transducers of extracellular signals (e.g. neuronal activity-dependent or from adjacent glial or endothelial cells) into the regulation of all phases of neurogenesis. The paracrine action of MeCP2 and Gadd45b are amongst the best known examples of this integration of intrinsic and extrinsic signals relevant for neurogenesis regulation [63–65]. Noticeable, these epigenetic regulators exert a complex orchestration of neurogenesis and, therefore, it is plausible that a deregulation of this epigenetic regulatory process is implicated in the neurogenic impairments observed in several neuropsychiatric disorders. Adult hippocampal neurogenesis represents an important, and formerly underestimated, form of neuroplasticity, namely in the hippocampal formation, a brain structure involved in several neuropsychyatric disorders [17, 18, 66]. Indeed, there is now mounting evidence for the implication of adult hippocampal neurogenesis in the pathophysiology of several neuropsychiatric disorders, a topic extensively reviewed elsewhere [16, 19, 67]. Perhaps one of the most striking findings in this scientific context was the involvement of adult neurogenesis imbalances in the pathophysiology of major depressive disorder (MDD), as in the action of several antidepressant drugs, thus leading to the substantiation of the so called "neurogenic hypothesis of depression" [68, 69]. In fact, several studies have linked reduced neurogenesis to depressive-behaviour and even to the action of several antidepressant drugs [70–73]. Indeed, during the last decade it became obvious the scientific insufficiency of the previously predominant neurochemical-based hypothesis to explain the precipitation of depression, with several authors putting forward alternative underlying mechanisms for the ethiopathogenesis of this disorder [74–76]. Impaired neuronal plasticity is increasingly viewed as central in the ethiopathogenesis of depression. In fact, during the last two decades a significant number of studies in this field revealed cell loss and neuronal atrophy, particularly in brain loci relevant for emotional behaviour control. Several mechanisms were proposed to be responsible for this neuronal atrophy, namely glucocorticoid and glutamate toxicity for both glia and neurons , decreased neurotrophic factors expression [78, 79], and, more interestingly, decreased neuroplasticity, including dendritic atrophy in the hippocampus in some executive-function brain centres as the prefrontal cortex (PFC) (Bessa et al., 2009b) in animal models for depression. However the most robust link between impaired neuroplasticity and MDD derives from a large number of studies reporting impaired neurogenesis in subjects displaying depressive-like symprtoms [80–82]. Further support to the association of hippocampal neurogenic control and depression, derives from the analysis of the effects of some antidepressants (ADs) in the adult neurogenic process. Counteracting the adverse effects of some of the inducing factors of MDD, ADs bolster neurogenesis in the mammalian hippocampal DG. This pharmacological enhancement of neurogenesis was reported with different classes of ADs, including selective serotonin reuptake inhibitors (SSRIs), monoamine oxidase inhibitors (MAOIs), tricyclic agents and even with putative ADs [70–73, 79, 83]. Consistent with the results obtained in animal models of depression, ADs also exert this pro-neurogenic effect in non-human primates and humans [84, 85]. Lastly, a third link between MDD and hippocampal neurogenesis, is reflected in the functional importance of the adult neurogenic process in some of the behavioural domains commonly affected in depressive patients, such as mood, anxiety and cognition [86–89]. However, the initial proposals claiming that the neurogenic modulatory effects of ADs were responsible for all the behavioural improvements observed after chronic treatment with these drugs is an oversimplification as demonstrated by several studies [70, 71, 90–93]. In fact, we have demonstrated that the short-term mood-improving actions of antidepressants depended on neuronal remodelling, rather than on neurogenesis . This is not surprising when considering that the pro-neurogenic effects mediated by ADs would not be of neurobiological significance at short-term, since a newborn neuron takes approximately a 5 weeks period to be fully differentiated and integrated in the neuronal circuitry of the adult DG. However, as the majority of studies focus on short-term analysis, one cannot rule out the possibility that the functional contribution of AD-induced neurogenesis will only take place at the long-term. In fact, preliminary data from our lab suggests that despite triggering an immediate pro-neurogenic response, the neurobiological importance of this effect of ADs becomes only significant later on the course of the disease, since the artificial suppression of neurogenesis by the anti-mitotic agent methylazoxymethanol (MAM) significantly compromises behavioural and cognitive long-term recovery, an effect that can be counteracted by ADs treatment (unpublished data). During the last decade, compelling evidence has emerged for the participation of epigenetic regulatory mechanisms in adult hippocampal neurogenesis. Therefore, it appears reasonable to conceive the hypothesis that dysfunction in epigenetic regulatory mechanisms might mediate the neurogenic imbalances responsible for some neuropsychiatric conditions, such as depression. 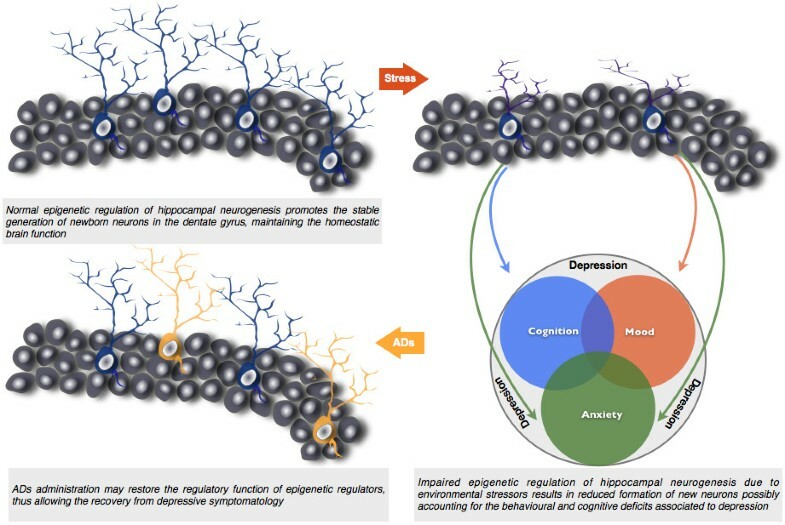 Although this idea is still controversial, several lines of research suggest that different epigenetic regulatory mechanisms of adult neurogenesis are affected in animal models of depression (Figure 3). Role of hippocampal neurogenesis in depression. Hippocampal neuroplasticity is increasingly viewed as central in the ethiopathogenesis of depression. Chronic exposure to stressors leads to dendritic atrophy on pre-existing granular neurons and compromises the generation of new neurons during adulthood. Data discussed herein strongly suggests that such impairments in the neurogenic process are likely attributable to dysfunctions in the epigenetic regulation of neurogenesis, possibly leading to the multidimensional behavioural deficits associated to depression. Conversely, the question whether the pro-neurogenic action of antidepressants (ADs), which allows to restore normal cognitive function, may be epigenetically mediated remains also to be elucidated. A paradigmatic case supporting this hypothesis is the already mentioned methyl-CpG-binding protein MBD1. In fact, an elucidative work conducted by Allan and colleagues , showed that Mbd1-deficient mice, besides having decreased NSCs proliferation, as already described by Zhao et al., also exhibit significant deficits in several behavioural dimensions relevant for depression: increased anxious phenotype, detected in both elevated plus maze and light-dark preference tests; behavioural despair, observed in the forced swimming test; and cognitive deficits manifested during the execution of Morris water maze spatial learning tasks . Another example derives from studies focused on MRG15, an active component of HDACs complexes, such as HDAC2 [95, 96]. Indeed, Mrg15-deficient mice present significant deficits in proliferation of neural progenitors and in their subsequent differentiation . Interestingly, HDAC2 has been identified as a negative regulator of memory, as HDAC2-overexpressing mice presented decreased spine density and synaptic plasticity, that correlates with reduced memory formation . These results confirm the involvement of this histone post-translational modifier protein in controlling both the adult neurogenic process and some of the associated cognitive abilities, also typically affected in stress-related disorders, such as MDD. Moreover, epigenetic regulators directly involved in post-mitotic neuronal maturation and differentiation, have also been associated with several behavioural and cognitive impairments present in several neuropsychiatric disorders. Work from Adachi et al. , for instance, has demonstrated that MeCP2 may interfere in neurological pathways that mediate heightened anxiety. DNMTS, active epigenetic regulators of adult neurogenesis, participating throughout all its phases, are also dynamically involved in blocking memory formation [99, 100]. Curiously, DNMT3b, an enzyme responsible for de novo DNA methylation, has been reported to have an increased expression in depressive suicide completers. Interestingly, this increase was significantly more pronounced in women, a result that is in accordance with the gender preference of MDD (twice more prevalent in women) . In addition, pharmacological and non-pharmacological treatments of depression, such as ADs and electroconvulsive shock (ECS) therapy, respectively, provide additional endorsement of the hypothesis that the neurogenic precipitation of depression might be, at least partially, epigenetically mediated. In fact, imipramine, a tricyclic agent with a well described pro-neurogenic action [70, 79], has behavioural improving actions in a socially defeated mice model, that correlates with downregulation of HDAC5 in the hippocampal region . In contrast, viral-mediated overexpression of HDAC5 counteracts the effects of chronic imipramine treatment in reversing depressive-like behaviour. Interestingly, HDAC5 participates in adult neurogenesis regulation, controlling both maturation and survival of newborn neurons . Interestingly, VPA clinical effectiveness as a mood stabiliser has been correlated to its neurogenic enhancement effect [104, 105]. Additional studies showed that VPA, in conjugation with sodium butyrate, when administered alone or in combination with the antidepressant fluoxetine, improves performance in animal models of behavioural despair [106, 107]. Considering that VPA is also an HDACi, and that HDAC inhibition is known to drive adult hippocampal neurogenesis , these studies highlight the importance of the pharmacological modulation of epigenetic regulators involved in adult neurogenesis to the efficiency of some ADs to ameliorate depressive behaviour. Non-pharmacological treatment of MDD, through ECS therapy, is also known to enhance hippocampal neurogenesis . Interestingly, Gadd45b-deficient mice fail to reveal the ECS-induced increase in adult neurogenesis , suggesting that the pro-neurogenic action of ECS therapy, important for reversing depressive-like behaviour, might be epigenetically-mediated by Gadd45b. Finally, it is worth to mention that this epigenetic regulation is also implicated in the vulnerability to stress, enhancing the susceptibility to stress-related disorders, in which depression is included. The role of such epigenetic mechanisms has recently been highlighted. Indeed, REST4, a splicing variant of the epigenetic orchestrator REST, has been shown to have an increased expression in rats exposed to stress early in life; importantly, these animals display enhanced susceptibility to stress and increased susceptibility to depressive-like behaviour . In addition, KAP1, a crucial component of a repressive chromatin complex, seems also to be involved in stress vulnerability. In fact, mice with deletion of KAP1 in the forebrain exhibit high levels of anxiety-like behaviour and significant stress-induced impairments in some cognitive domains, such as attention and spatial reference memory [110, 111]. Therefore, and although not directly involved on neurogenesis regulation, epigenetic-mediated increases in the vulnerability to precipitation factors of depression, such as stress, may lead to an accentuation of the detrimental effects upon the neurogenic process dynamics and its regulatory mechanisms, thus favouring the development of deficits at the behavioural and cognitive levels. The dynamic and environmentally driven modulation of neuroplasticity in the adult brain plays a crucial role in the ethiopathogenesis of depression. As discussed herein, the last two decades provided several lines of evidence supporting the implication of hippocampal neurogenesis in the maintenance of the homeostatic brain function and its importance in the pathophysiology of MDD (Figure 4). However, approaches to this topic have been largely descriptive and the field still lacks an integrative perspective regarding genes and molecular determinants influencing neurogenesis in the installation of such neuropathological conditions; importantly the same holds true for the positive action of ADs in this process. Our comprehension of how adult neurogenesis is regulated begins now to be complemented with new insights into the complex epigenetic orchestration of this phenomenon, a regulatory dimension that is relatively new in neuroscience research. Yet, the scattered evidence gathered so far, opens a new dimension for unravelling the mechanistic explanation for the interplay of genes and environment that is central in several neuropsychiatric pathological scenarios. In fact, studies in this area endorse the role of epigenetic mechanisms as transducers of the environmental signals into transcriptional outcomes, strongly suggesting that they may participate in the precipitation of experience-dependent psychiatric disorders, like depression, and simultaneously mediate the pro-neurogenic action of commonly prescribed ADs. Therefore, epigenetic mechanisms begin to emerge as mediators through which environment modulates neurogenesis with long-lasting and stable repercussions in several behavioural and cognitive domains (Figure 5). In this perspective, it becomes plausible that by reverting the pathological effects on epigenetic key regulators, one can counteract the deleterious effects of stress and other precipitators of depression, thus restoring normal neurogenic function. Hence, future research focused on dissecting the epigenetic pathways that modulate the adult neurogenesis process will be decisive to further unravel the neurobiological basis of depression and may pave the way to the development of novel therapies and to the discovery of new therapeutical targets in this pathological context. 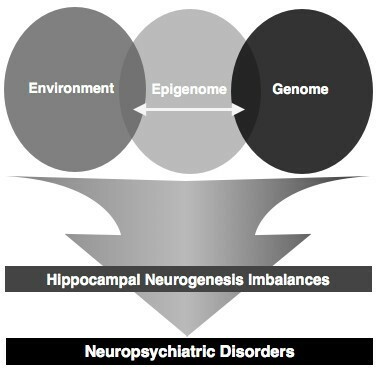 A neuro-epigenetic hypothesis for the ethiology of neuropsychiatric disease. Such hypothesis states that Impairments in the environment-genome interplay mediated by epigenetic regulation may account for the imbalances observed at the hippocampal neurogenesis level, thus triggering the onset of the symptomatology typical of such disorders. AP drafted the manuscript. LP and NS revised the manuscript and coordinated the work. All authors read and approved the final manuscript.